PUPPY/JUNIOR with fresh chicken and rice is for small and medium breed puppies and adolescent dogs formulated to meet the nutritional requirements for healthy growth and development. All Arden Grange products are hypoallergenic and free from wheat gluten, dairy products, beef and soya. They contain no artificial colourings, flavourings or preservatives. Feeding Arden Grange reduces the risk of dietary intolerances and allergies that can cause digestive disorders and skin complaints. 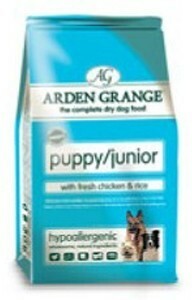 Feeding recommendations: Arden Grange PUPPY/JUNIOR should be fed from 8 weeks of age to 12 months of age. After 12 months of age, you may change to one of the Arden Grange ADULT diets. Ingredients: Chicken Meal* (min 31%), Rice (min 19%), Maize, Chicken Fat, Beet Pulp, Fresh Chicken (min 5%), Dried Brewer's Yeast, Egg Powder, Fish Meal, Linseed, Fish Oil*, Minerals, Vitamins, Nucleotides, Prebiotic FOS, Prebiotic MOS, Cranberry Extract, Chondroitin Sulphate, Glucosamine Sulphate, MSM, Yucca Extract. *Preserved with mixed tocopherols and rosemary extract.